Although eczema affects the skin, it is not just skin-deep. This skin disorder can have a serious impact on a baby’s overall health and well-being if not treated immediately and managed properly. A baby suffering from eczema is the ultimate feeling of lack of control for a parent because it breaks your heart to see them suffer and not be able to fix it. 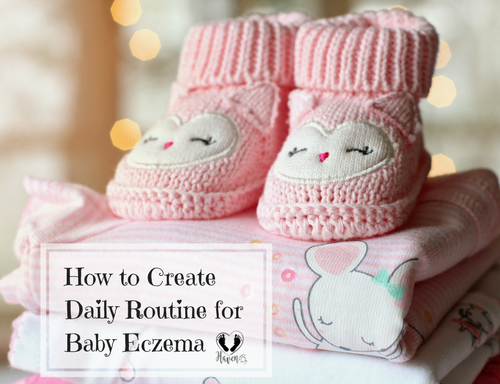 Although there’s a certain element of acceptance of the inability to control all aspects of eczema, we as parents want to do everything in our power to make things better. Here are the potential effects of eczema and how to minimize the effects. Because eczema skin is dry and easily irritated, it often leads to a continuous cycle of itching and scratching. 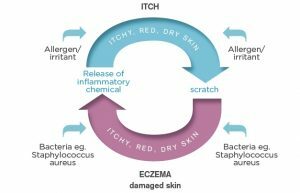 Scratching eczema-affected skin triggers the release of a chemical called histamine which causes more itching and contributes to the ‘itch-scratch cycle’. Also, scratching further irritates and damages the skin barrier, allowing airborne allergens to enter the skin then causing the rash to flare-up. The areas of the skin that are flaring are more susceptible to bacterial skin infections and will make the itching worse. Unfortunately, it is near impossible not to scratch because scratching generates another sensation (of pain and heat) that suppresses the feelings of itchiness temporarily. The problem is that once the other sensation subsides, the itch returns and you feel like scratching again to relieve yourself. Eczema is often referred to “the itch you can’t scratch”. Younger babies ages 3 to 4 months have developed enough muscle coordination to get a grip on small objects, but may not have learned to scratch their skin until they are 6 to 8 months old. Instead, younger babies will likely fuss and cry or move their hands in an effort to scratch when they are in discomfort from the eczema. The best way to prevent and minimize the scratching is by identifying and removing the triggers whether it be from food or environmental factors or a combination of both. 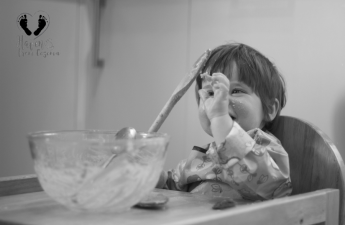 Dietary factors are more likely to cause an exacerbation among babies with eczema. Since completing a food challenge will take some time, I recommend in the meantime establishing a good daily skin care routine for your baby. 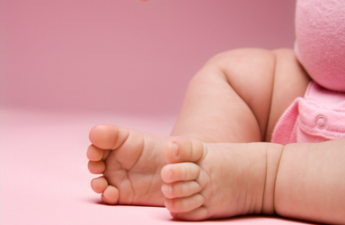 Proper bathing and moisturizing will help heal, rebuild and maintain baby’s skin. Some older babies learn that scratching gets their parents’ attention. When his happens, scratching can become a habit. 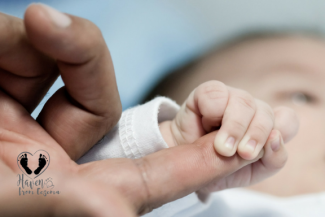 These characteristics should not be judged as “good” or “bad.” The goal of a parent and caregiver is to identify these features in their baby and channel these features to work to the baby’s advantage. For example, a baby that feeds frequently would not do respond well to a schedule. Early on these smart babies learn that the breast or bottle is not only a source of nutrition, but also a source of comfort. Continue to provide this comfort in baby’s time and lead. The ultimate goal of a parent is to give their growing baby comfort and peace during those high need times, this will help baby learn eventually to create comfort and peace on her own. In combination of your baby’s eczema treatment and management plan, your most valuable survival tip is to practice attachment parenting. Here are some more survival tips for our high need children. Itching from eczema may get worse at night. You may notice your baby is unable to fall asleep or waking up several times during the night. A lack of sleep can aggravate eczema symptoms, which can further impact sleep, creating an unpleasant cycle. Further, the skin takes less time it needs to repair and regenerate itself. Inflammation from the eczema and the itching disrupts the sleep. By removing the triggers (allergens), having a disciplined daily skin care routine, and a proper bathing routine, sleep will improve and baby can get the rest he or she needs. You can find more tips and tricks on how to help baby sleep better here. A type of bacteria called Staphylococcus aureus oftentimes causes an infection in open and broken areas of skin affected by eczema. Staph bacteria are usually harmless, but they cause an infection and can make eczema worse. These bacteria can also be found on the skin of people who don’t have eczema, but there is notably more staph on people with eczema. Other differences between eczema skin and healthy skin include defects in the skin barrier caused by a gene mutation, which allows allergens and bad bacteria to pass more easily into the body. The skin has a formation of yellow crusts. Baby has a raised temperature, flu-like symptoms or swollen glands in the armpit, neck and groin. The best way to prevent skin infections on your baby’s skin is to reduce the amount of staph on their skin. Most dermatologists and pediatricians recommend bleach baths 3 times a week to reduce bacterial colonization of staph on the skin, which has been found to be very effective. An alternative to bleach baths is dead sea salt baths or apple cider vinegar baths. Sea salt soap is also another great method in reducing overall bad bacteria and germs on the skin especially for those little ones who are now walking and more active. It is much cheaper and more convenient than setting up a bath. Just lather up the bar of soap and gently rub all over the body and rinse off. Repeat a few more times with a thorough rinse at the end of the bath. For the face, apply just underneath the eyes and rinse off immediately. 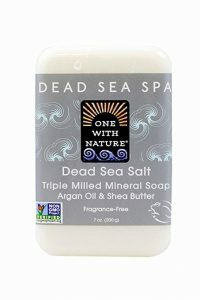 This dead sea salt soap leaves the skin very soft and moisturized after every bath. You can also use this soap when washing your lil one’s hands after meals and playing. A potential lead in reducing the amount of staph bacteria on the skin is to regularly apply topical probiotics. While it has been known that probiotic supplementation taken orally has been found effective in treating acne and other inflammatory skin conditions, recent discoveries show that application of a topical lotion formulated with beneficial bacteria protected against skin infections by destroying harmful bacteria on the skin. Those with eczema will need to continue applying the topical probiotics because their bodies do not naturally promote the growth of these beneficial bacteria. Traditional treatments use antibiotics, which not only kill bad bacteria but also kill the beneficial microbes that we’re now learning can actually help our skin. So, in the case of diseases with an imbalance in microorganisms that include atopic dermatitis (eczema), topical probiotics present an effective alternative to strictly antibacterial products or remedies. Fortunately, I have researched and found a few safe and effective topical probiotics to use on babies’ skin. As with anything else, be sure to follow directions of the product and discontinue use if there are adverse effects. 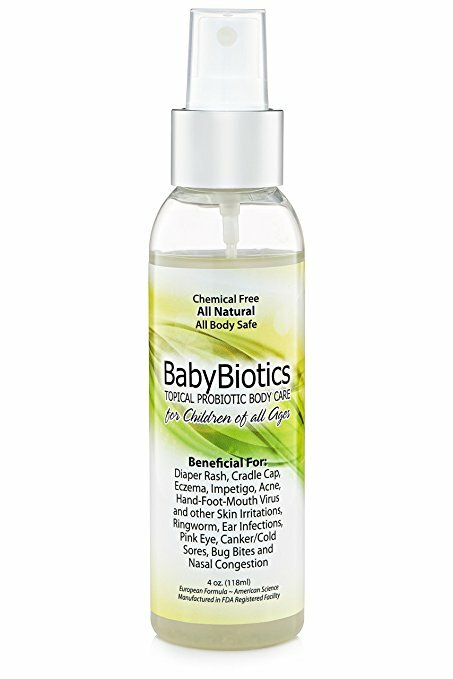 Baby Biotics – All Natural Topical Probiotic Spray for Diaper Rash, Cradle Cap, Eczema, Rosacea, Hand-Foot-Mouth, Bug/Ant Bites, Sores, Cuts, Acne and Other Skin Irritations. It also works as a barrier against germs, bacteria and fungal. The spray contains 150 million CFU’s (colony forming units) of Bacillus Coagulans, a bacteria strain which has been found to help improve skin and to build a stronger gut and immune system. Check Out: Topical Probiotics, the New and Natural Remedy for Eczema for the list of other safe and effective topical probiotics and how to properly apply them on eczema skin. Eczema is considered to be part of the “atopic march” which involves the diagnosis of eczema during infancy, followed by food allergy, allergic rhinitis (hay fever) and asthma, typically in that order. Unfortunately, eczema can increase an individual’s risk of developing these allergic disorders. Being prone to develop allergic conditions is a genetically inherited trait, however, the conditions or environment a child grows up in also affects the development of allergic conditions. There are ongoing research to better understand the “atopic march” and hopefully help scientists and doctors develop strategies to prevent allergic conditions from occurring and put a “halt” to the march. For example, studies have shown that starting a young child with environmental allergies on immunotherapy (allergy shots) can reduce the child’s risk of developing asthma. Additionally, new studies suggest that introducing some highly allergenic foods such as peanut earlier in life may reduce the risk of developing food allergies in children with eczema. Research offers promising evidence that probiotic supplementation might help treat baby eczema and other allergic diseases. C-section babies should start on the first day of life. Babies born to mothers who have been on many antibiotics and have a family history of eczema and other allergic diseases should also start early. Babies experiencing eczema symptoms and other allergy symptoms should also start as soon as possible. As parents and caregivers of babies with eczema, you will soon notice or have already noticed the vicious cycle of eczema which involves the constant itching and scratching which then leads to breakage of the skin, flare-ups and the risk of infection. When treated, the skin heals and clears but soon enough the skin becomes dry, brittle and itchy again and the vicious cycle continues until we stop it by ensuring there is no more breaking of skin. Next: Do Babies with Eczema Have Allergies?